In a funny and uplifting speech, the talk host called for a return to kindness. camera (Michael Rozman/Warner Bros.) In this photo released by Warner Bros., a taping of "The Ellen DeGeneres Show" is seen at the Warner Bros. lot in Burbank, Calif.
Ellen DeGeneres is urging the country to come together after a divisive election in which Donald Trump upset Hillary Clinton to win the presidency. The "Finding Dory" star actually taped her monologue Tuesday before the results came in. "Well, well, well. The election is finally over. I don't want to know the results, don't tell me. Don't spoil it. It's on my DVR. I'm watching other stuff," she told the audience. "The truth is we're taping this show on Tuesday afternoon, so people at home you know something that I don't and that we all don't." Then DeGeneres focused on what happens now. "People have been very passionate about this race. And I think it's because we all love our country, we just have different ideas about what's best for it, which is part of what makes America great," she said. "And I believe we can all come together because if you take away the labels, you realize we're far more alike than we are different." 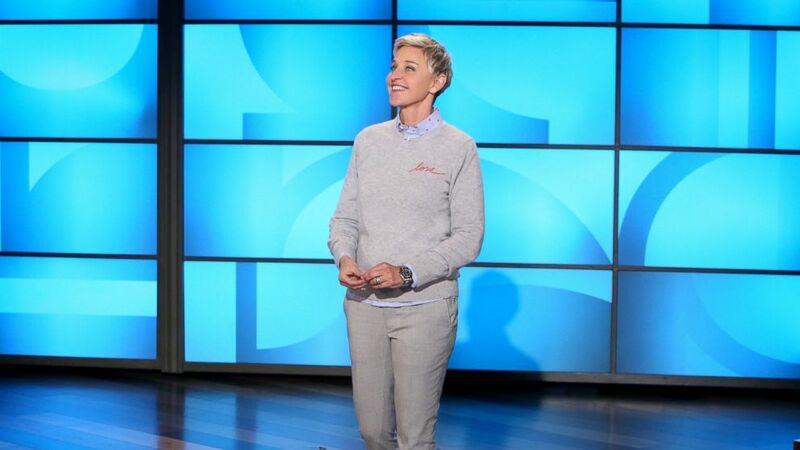 DeGeneres then injected a little humor into her speech. "For instance, no matter what your politics are, we all have that feeling of stepping out of the shower and realizing you left the towel completely across the bathroom," she joked. "And you have to do that shimmy on the bathmat all the way across where you try to get the minimal amount of water, trying to tiptoe like, 'Just that one drop of water will be there if I do it that way.'" She continued: "We all do that thing where you're pulling into a parking garage and you duck your head just to make sure you make it. It doesn't matter if you're a liberal or if you're conservative, we've all passed out watching Netflix and woke up not knowing what episode we're on, what season we're on, whose couch we're on." She concluded her message with a plea for more kindness and understanding. "What I'm trying to say is that we have so much in common, our differences actually make us stronger," she said. "We need to have the kindness and respect for one another. Here's where I make the exception: the people that leave the shopping carts in the middle of your parking spot. Out of the country. Kick them out of the country. Bring the shopping cart back!"